Optimarketer: The Marketing Optimization Blog is about optimizing every major marketing element. This morning I found something that may help us determine -- with a fair degree of certainty -- the origin of David Ogilvy's most famous headline. The opening paragraph of body copy may be our smoking gun. 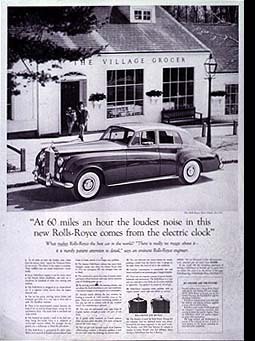 It reads, "'At 60 miles an hour the loudest noise comes from the electric clock,' reports the Technical Editor of THE MOTOR." Unfortunately, THE MOTOR -- which was published in the UK -- isn't listed in the Reader's Guide to Periodical Literature, and copies from that era are rare. But I'll try to find someone able and willing to go through relevant issues. Stay tuned. The only sound one can hear in the new Pierce-Arrows is the ticking of the electric clock. Founder and president of Contenteurs, creators of content marketing campaigns that make a measurable difference. On Is It "Old School" To Use Inbound AND Outbound Marketing?